Episode #25 of Hindi TV Serial Bharat Ek Khoj explores the tale of Prithviraj Chauhan further. The content is inspired by Prithviraj Raso, a bravery poetry (or epic poem in Brajbhasha ) by Chand Bardai, the court poet of Prithviraj. It was the time when Prithviraj was just married to Sanyukta. And as we know, the initial phase of married life is the golden period of the same. So Prithviraj also got quite busy in enjoying his life and hence it was strictly prohibited to disturb the king during the phase. When you have the responsibility of many people, even a small ignorance can prove really costly. And that is what happened in this case also. Furious by his loss, Shahabuddin Ghori now has prepared even bigger army and already left Ghazni to attack India. While the commandants and other key people of Prithviraj’s kingdom were quite sure that they will again defeat Ghori, no matter what and thus the king was not informed. Actually, no one dared to disturb him. But then came Chand Bardai. Being the fearless patriot, he decided to take the ultimate risk and inform Prithviraj about the realities which he is not aware of. But, will Prithviraj awake on time and do the needful to overpower Ghori’s attack? Will Ghori get the support of any other traitor from the land? What happened in this battle is almost well known to those who are familiar with history. And Ghori was not willing to do the mistake Prithviraj made. According to Ghori, the loser in the battle shouldn’t possess any right to be treated well. He wanted to punish Prithviraj in a way that it will instill fear in the people. So, no one in the future can think to go against him. What he does is the history. But, the bravest chapter in the same segment is written by Chand Bardai. What he does and what he made Prithviraj do is remarkable, not only in the history of Bharat but also in the world! I will suggest you watch the episode to know more about it. This episode is made available to watch for free on YouTube by Public Resource Organization. In terms of the content, the episode is backed by something historical which is mostly recognized by the viewers, as it is not so distant in the past. The Delhi Sultanate’s traces are found to very recent past. And the name of Chand Bardai is not unknown, especially in north and western segments of India (that is Bharat). If we forget about the historical accuracy or for that matter inaccuracies, there are various life lessons to learn from the content. The basic most lesson is when you are ignorant you will have to pay the price, sooner or later. Since the ages of Ramayana and Mahabharata, the wars in this land are fought by following rules (or Dharma in broad aspect). But you need to understand your opponent and whether he considers same aspects and rules. If not, then the opponent will consider you stupid and when getting a chance he will take over. Don’t we see such things happen in our society, our surrounding, even in modern days! Also, you need someone, be it a relative, a friend, an adviser or anyone, who hold the courage to tell you the truth and stand with you, no matter what. In that aspects, Prithviraj was lucky to have Chand Bardai, who decided to do everything for his master who is no less than his friend. Prithviraj was definitely brave and courageous ruler. His fearless persona is respected and at the same time, he has his mortal limitations as well, like any of us. Despite the story is known, I don’t want to spill the beans about the content, especially from the second half of the episode, I would not talks much about it. But, I will recommend you to watch the scene when Chand Bardai goes into the private place of Prithviraj to tell him the truth. See how fearless and truthful he is and hears the dialogs he is uttering with proper attention. Do you think an ordinary man can tell such bitter truth to a ruler? The episode excels in many aspects, be it acting, writing, background music or even wardrobe. Ravi Jhankal does ultimate justice to the role of Prithviraj, he is simply superb. If you’ve watched Vijay Kashyap in Yeh Jo Hai Zindagi or Tenali Rama, you will be stunned by the performance he gave as Chand. It is quite opposite of those roles in terms of persona, but he slips in quite effectively. K. K. Raina is an amazing actor. Again, compare his performance as Ghori against his portrayal of Ajit Banerjee in Byomkesh Bakshi. Nisha Singh does her bits as Sanyukta. She has the glamour needed for her role. Rest of the actors tries their best and some of them are good, while other let down a little. The dialogs are the first rate. They are simple yet effective. Same we can say for the narration. 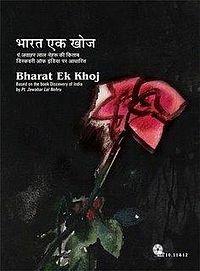 Please don’t give a miss the poetries, especially the ones with “Veer Ras”, sung by Chand, along with his dialogs. The script flows in at almost proper pace. The cinematography is good too. The experiments of showing the modern wold immediately with the presence of Pt. Nehru, directly from the sets of old times, works well. The efforts put in by the team to find proper locations and choosing wardrobe elements, are visible on the screen. While the DVD set comes in two versions, Economic and Premium, the price of the premium version is double (if not associated with any purchase offer) than the economic one. Public Resource Organization has published this content publicly to watch for free, but I personally will suggest you to buy DVD set and keep it in your collection. Here are some of the WikiPedia Links which are related to this episode content. Overall a TV series episode which explores some of the important chapters of the history of India. Good acting, remarkable dialogs, and complimentary music make it worth watching.